A quick roundup of some of the beers I've had recently. I don't want to write tasting notes as such, so I'll just give a bit of a summary on each beer with some notes on flavours as I go. Gadds' India Pale Ale. I was expecting a big IPA from this one with a dry body and big English hop flavour. In actual fact, it's quite different to that. The smell is alcohol, yeast, pear and apple fruit and then a distinct butter scotch aroma. The taste is yeasty with big buttery and butterscotch notes, leading to a dry bitter finish. I was impressed but I'd opened this one with a taste for IPA, I think this is closer to a Belgian blonde if anything. This is definitely a beer I want to drink again, if I have this knowing what to expect, I think it'll be truly excellent. Flying Dog Classic Pale Ale. What a glorious colour this beer is. Flame, copper, red. When I get round to brewing an American IPA, this is the colour I want it to be. The smell has some maltyness to it but is mainly big American hops. Orange and lemon, a really juicy smell that makes you thirsty. Some sweetness up front, quite thin tasting in the middle, quite subtle hopiness towards the end then a dry bitter finish. For me, the taste doesn't quite live up to the smell though, the body is a bit too thin and fizzy and there just isn't quite enough punchy hop. What results is something that reminded me of an orange soluble Aspirin dissolved in water. Tangy, soapy and fizzy, too diluted, too weak, not concentrated enough. Flying Dog Gonzo Imperial Porter. Jet black in colour, like looking at oil, with a medium tan head. The smell is big American hops with a malty, roasty, alcoholic background. The taste is massive, loads of bitter chocolate going into roastiness and a real earthiness. It then all moves on to a citrus zingy finish that fizzes it's way across your tongue. There's a real cleanliness to the finish that means the big flavour doesn't over power, you finish one sip ready for the next. I can see this working with a heavy pudding, something like a Christmas cake where the fruits will be complemented and your palate will be lifted of all that heavy cakeyness. Great beer. 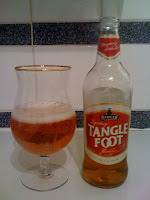 Badger Tanglefoot. 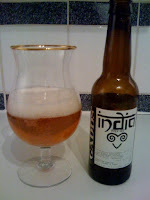 I'm finding it really difficult to get interested in English bitters, like this one, at the moment. The colour is a lovely copper with a fluffy white head that actually does stick around for a while. The smell came across as very lager-esque to me, with some extra hop spiciness and sweetness. Taste is okay: crisp, clean and refreshing with some fruitiness as it warmed, but it suffers slightly due to some distinct metallic notes in the finish. To me this beer feels somewhere between a lager and a bitter and I think would appeal to a lot of lager drinkers. This isn't bad, it's just nothing to get excited about. 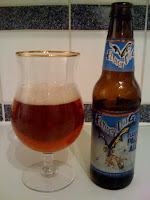 To be honest, when I had the Flying Dog Classic Pale Ale, I think I was in a bit of an IPA groove and was unfairly comparing it with other big American IPA's subconsciously. When you're in that kind of mood, anything that doesn't have huge hop flavour will always disappoint.